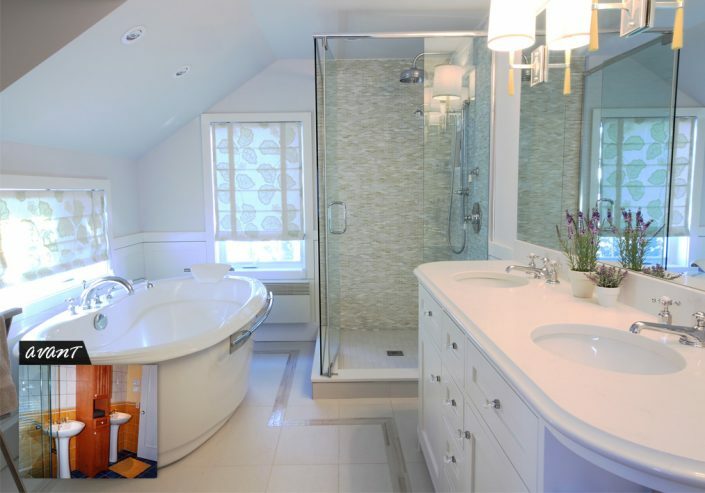 Be inspired by this magnificent bathroom renovation project in a La Prairie residence. 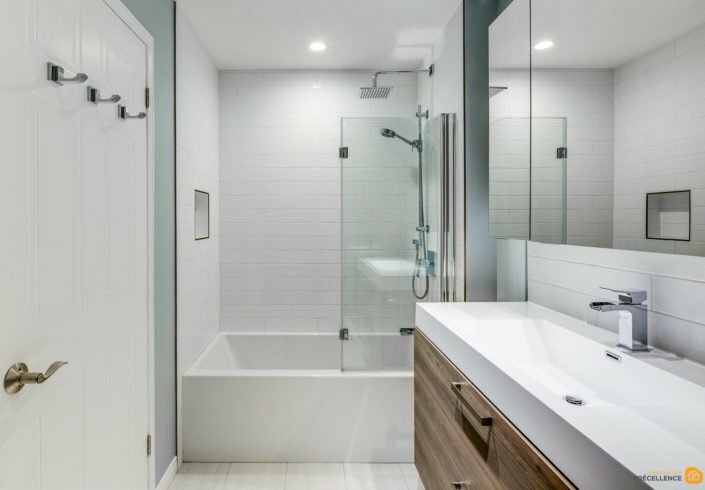 You too can benefit from our experience as a general contractor specializing in bathroom renovations, and from our turnkey renovation services. Call us for a free consultation! If you have been living in your home for a while, you may want to change the decor of your bathroom with a little more than a few coats of paint. 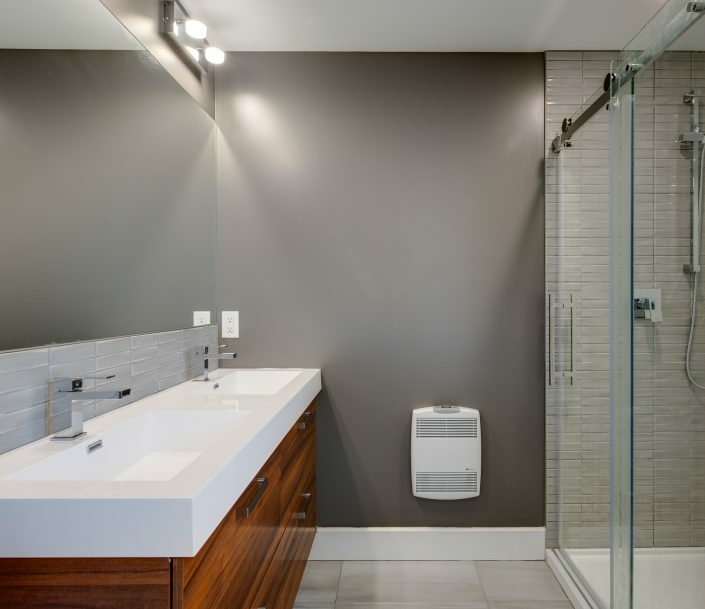 These clients from La Prairie, in Montreal, wanted to completely transform the configuration and decor of their bathroom to make it more practical and stylish. With the help of our design team, we designed a dream bathroom that would suit all their needs. First, we had to demolish the bathroom almost completely: removal and disposal of the vanity, counters, cabinets, shower, bathtub and floor. We also did some plumbing work to accommodate the new installations. Our customers were delighted to be able to share their ideas with us and opted for a beautiful grey ceramic tile floor to match with a new contemporary style. 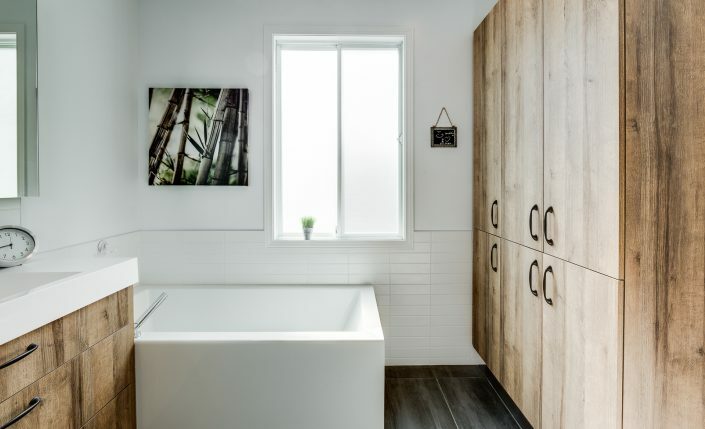 Subsequently, we had a custom bathroom vanity manufactured with white laminate cabinets and black laminate cladding, in addition to a rectangular porcelain basin and stainless steel fittings. The vanity is surmounted by a medicine cabinet covered with a mirror. Our designer recommended a recessed porcelain bathtub with ceramic tiles (two shades of grey) with stainless steel fittings with hand shower. We have also added white laminate cabinets for maximum storage. The centrepiece is the classic shower with above ground shower with glass doors with stainless steel shower phone and grey ceramic tile walls. Customers have also added red accessories to create a contrast effect. The lighting consists of recessed ceiling lights. The final result exceeded all their expectations! As a general contractor specializing in bathroom renovation, it is our duty to take charge of every phase of your project: conceptualization, demolition, design, construction and renovation. To achieve this, Construction Précellence has established lasting partnerships with flooring specialists, cabinet and bathroom countertop manufacturers, electricians, painters, plasterers and designers to make this project a success! 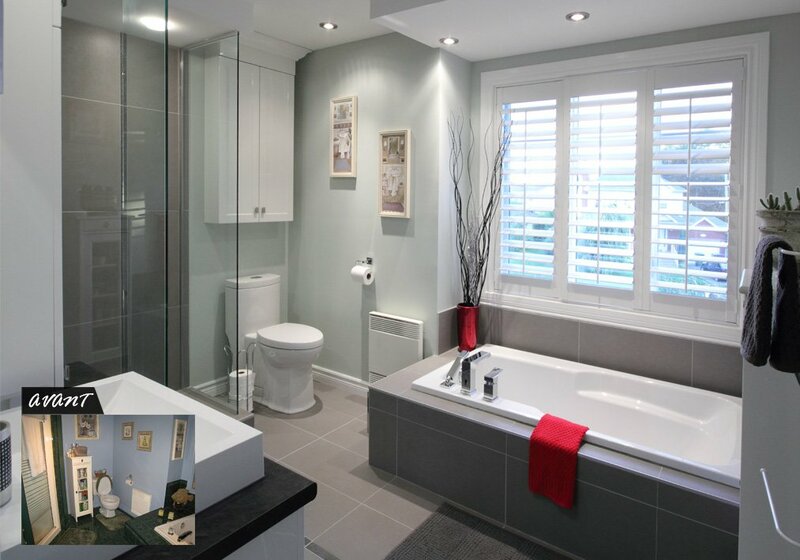 If you have any questions about the bathroom renovation project at La Prairie in Montreal, our turnkey bathroom renovation service, or our prices, please do not hesitate to contact us by email or phone. Your first consultation is free of charge! Our team will be happy to welcome you and give you all the information you need!